Playing Together: It’s Been Good For Us! Family day is coming. It got me thinking about the things I love about our family. That caused me to think about how my Mom and Dad shaped the family I grew up in. Something I absolutely LOVE about my parents is that they know how to play. I hope you caught the present tense of that statement. My parents, to this day, get wet, snowy, and if the weather dictates it, dirty with us. At 18, 15 & 14, my kids are beginning to realize how special that is. Growing up we camped every summer. Driving along to our destination my Mom would get Dad to stop to identify flowers she didn’t recognize. After setting up camp we would go exploring and learn to identify berries, trees, lichen, moss. That made hiking more fun. It seemed less like hiking! We would swim, build sand castles and dig for clams. We had snail races on tree stumps and did all sorts of things. It was amazing. The best holidays ever and we didn’t have to leave the country to have them!! We developed a couple of sayings out at the lake. My Dad’s favourite line was “The sun always shines at Ness Lake!” with some one muttering “At least once!”. “If you aren’t falling, you aren’t trying hard enough!” became a favourite saying as well. It was nice to push each other to be better and try harder. Soon we were all slalom skiing and “fighting” for the next turn behind the boat. It was more fun with friends and so we usually had a group out there with us. They kept it simple, no out buildings and I wouldn’t have it any other way. Because of that, my parents were free to play with us the whole time we were out there. They weren’t busy with other things, they were focused on us. On a summer day, my happy place was at the lake with my family. Summer evenings were spent with my family. If my friends wanted to come they could, but being introverted, I was content with just my family and close family friends. My sister who is extremely outgoing did the same. We loved being together with Mom and Dad and family friends. In winter we cross country skied. It is my fault we stopped. I hated it. Really hated it. When I was ten I had a terrible fall and ripped every shred of soft tissue in my right knee. That is when we stopped. Up until then Dad always patiently stayed with me and got me through it. He would send every one off ahead so they wouldn’t be affected by my bellering and bad attitude. I am ashamed now, because I cannot wait to get back to cross country skiing. I am so sorry Mom and Dad!! When my sister and I took up down hill skiing as teens, Mom and Dad were not going to be left behind. Even though they grew up in the flat lands of Saskatchewan, they got on the hill. Their first time out together, Dad came home with a broken thumb and Mom came home with a badly sprained knee. The next Christmas we all got ski equipment and headed to the hill every Saturday. 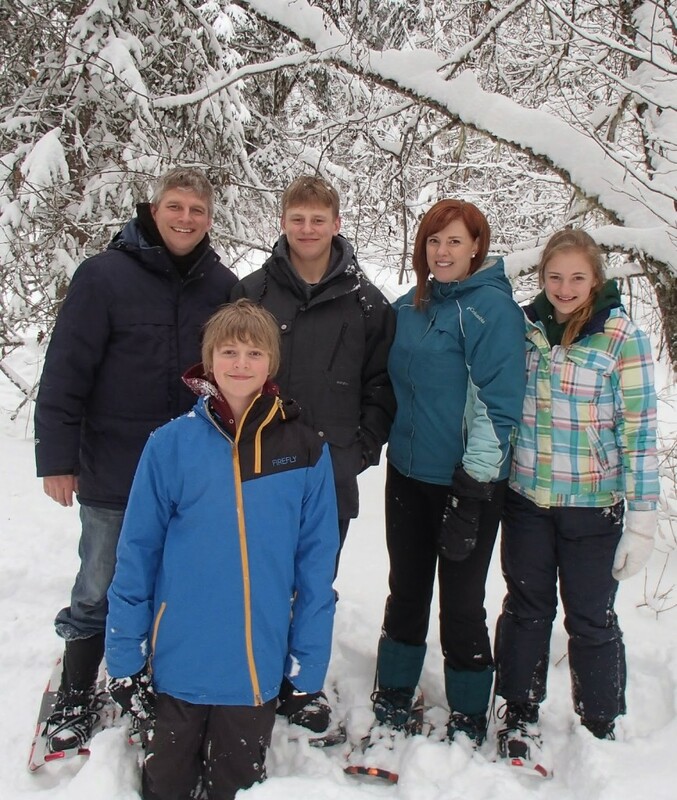 We went as a family, skied as a family and built great memories as a family. If my friends showed up at the hill, I would take a run with them but I always went back to ski with my family. We would laugh together over spectacular falls, it was so much fun. Again, it was a family thing and though we enjoyed our friends. Skiing was what we did with Mom and Dad. I realized that this was one of the things I loved most about my family. I knew having a husband who could play and valued these things was important to me. I grew up knowing playing together was good for my family and wanted to bring that into our own family. 1. It brings the generations together. I love that summers at the lake are still happening. It is still my favourite way to spend a summer day! My Dad loves nothing better than to be pulling his grand kids and their friends behind the boat. 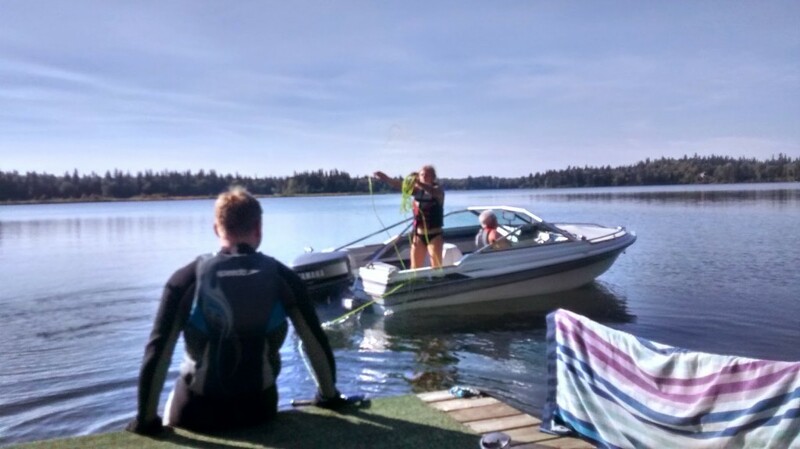 Mom loves nothing better than to teach the kids and their friends a skill behind the boat! They play with the kids still and that is the greatest way to relate to their grand kids and us! It can be especially hard to interact with teenagers, it is so much easier when you can play with them. It has kept all our relationships growing. In winter if we head to the ski hill, Mom and Dad often join us. My kids love it when they show up, so do their friends! 2. These memories together have been amazing and I love that my family can share these activities. Reminiscing over that spectacular fall, or how hard some one worked to get their deep water start. Being able to encourage them on how quickly they are improving at something. Laughing about their first time trying the ski course or when they wiped out on a ski lift. The laughter, moments of cheering each other on draw us closer. 3. It builds common ground. It brings our worlds together and builds shared interests. That becomes the way to spend time together and everyone wants to join in. Loyalty to one another is built through shared recreation. Everyone enjoys it more when everyone comes along. 4. Talking together just naturally happens as we play. It helps us reconnect. We feel closer together when we play together. Up north, it is the best way to make it through the winter. I love it when we can head out for a snow shoe in the evening or go sledding. Or when our kids were little and we would go over to skate at the ice rink. It made our evenings more fun and that fun happened because we were together. 5. Our different personalities show up in the ways we each play. Everybody approaches the recreational activity in their own way and we can learn to enjoy our differences. It helps us build respect for one another and appreciation for each others way of seeing and doing things. Our activities have changed as our kids interests have changed and that is OK. Snow shoeing, skiing, sledding, swimming, paddle boarding and water skiing have been the constants. Camping is still our favourite way to holiday in the summer. Craig is the sand castle king and as he and the kids get going on one, there are often kids from other families who have asked if they can help. We have been able to share a lot of what we love with our own kids. I feel so privileged that we have had those opportunities. We have built so many great memories together doing these things. I am thrilled that our kids will still play with us. I am so glad that they choose to come to the lake for summer evenings, and that at the hill they still hang with us. I treasure these moments together! I hope family day finds you playing together however your family likes to play! It is worth it in so many ways!! Previous Post Faith, is it really such a leap? Next Post Is It Love Or Lust?